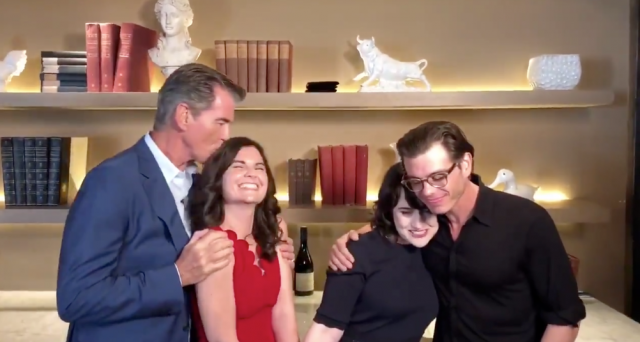 Pierce Brosnan has reunited with three of his Mrs. Doubtfire co-stars, 25 years after the film was released. The film starred the late Robin Williams as Daniel Hillard, who disguised himself as female housekeeper Mrs. Euphegenia Doubtfire in order to spend time with his three children after a bitter divorce from his wife Miranda (Sally Field). 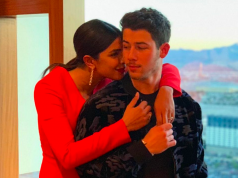 In the popular movie, Pierce played Miranda’s new boyfriend Stuart Dunmeyer, and he recently reunited with Matthew Lawrence, Mara Wilson and Lisa Jakub – who played the three kids in the film. In a video shared by Lisa on Wednesday, Pierce held a camera up to his phone as he showed a picture of her, Mara and Matthew as children at the premiere of the 1993 film. “Here you go – at the premiere of Mrs. Doubtfire and here we are, we pull back slowly, tada!” Pierce said, showing how they’ve all grown since their child star days. “Love you, love you all so much. So good to be a part of your lives. I want to get into the picture as well,” he gushed, as he huddled in for a photo with them. Mrs. Doubtfire celebrates its 25th anniversary on November 24.